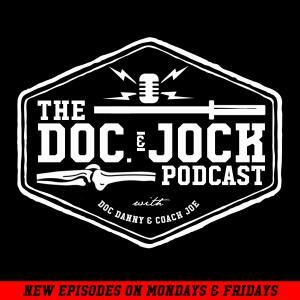 On Episode 211 of the Doc and Jock Podcast Coach Joe discusses the benefits of sitting in I-5 Traffic, discusses the importance of training during stressful moments, and shouts out 2 powerful parents. To follow along with the show, or a part of it, check out this instagram post! Also, gang, you may have noticed that Doc Danny and Coach Joe have each started two other podcast projects with tighter focuses. If you haven’t checked out Doc Danny’s PT Entrepreneur or Coach Joe’s Everyday Weightlifter be sure to do so. While you at it tell a friend, subscribe, rate and review! These guy need all the help they can get!